Chart of the Day: High Yield Risk Premium and What it Tells us! There is nothing normal or rational about this chart at all. 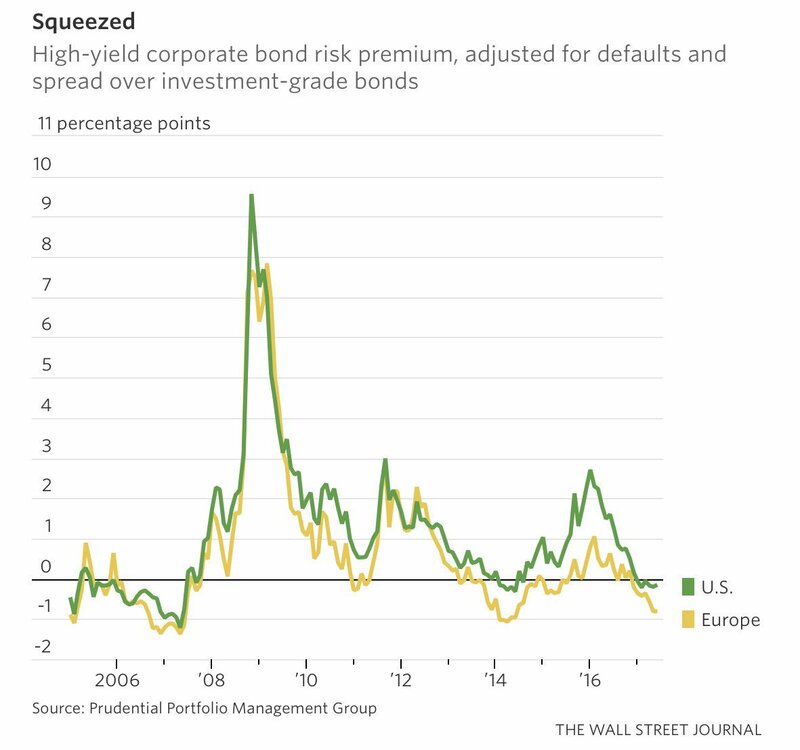 This chart is reflecting a world where central banks have distorted and destroyed any idea of a functioning market by taking rates to zero (or even sub zero), while suppressing bond yields through Quantatative Easing (QE). In a ultra low rate environment as we are in today, pension funds and all kinds of financial institutions with a set minimum rate of return for their respective quazi ponzi scheme to function are being forced further and further out on the risk curve due to “reach for yield”. If a pension fund HAS to have a 6% ROI to deliver on their future obligations, is it surprising that they pile into high risk assets when they get zero or close to zero yield on investment grade bonds and/or sovereign bonds? Many stock markets at all time highs with expected negative returns in the coming 10 year period based on historic averages doesn’t help either. BUT since some stocks still produce a dividend yield above 0%, they are also forced to bid stocks ever higher despite PE ratios at historic highs. What doesn’t produce a yield? Commodities. 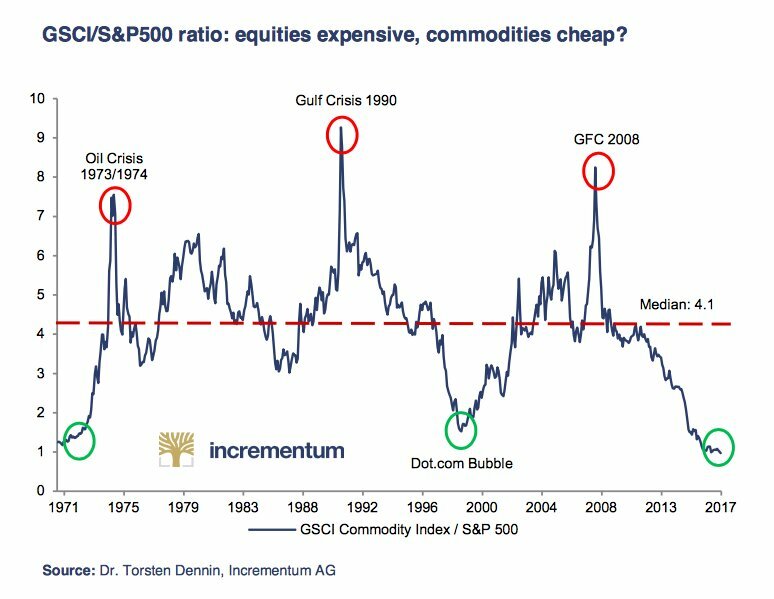 Commodities vs equities (lowest in 46 years!). If the Sovereign bonds yield zero on average, that means that 70% of the portfolio must produce an annual ROI of 8.6% to make up for the 0% ROI of the sovereign bonds. This will thus force the pension fund to invest in higher yield (and riskier) stocks and corporate bonds. When many financial institutions behaves like this, it can result in distorted risk premiums as seen in the first graph. Not only do these funds take on more risk, but they buy assets with degrading Risk/Reward profiles. In the end, we have pension funds etc with a much higher risks alongside worse Risk/Reward components. Bear in mind that this kind of increased risk taking doesn’t even guarantee that the funds reach their 6% ROI requirement. This article is a snapshot of the reasons why I think that most peoples pensions will more or less go up in smoke because of increasing risks coupled with lower yields since it takes less to produce negative returns and it is harder overall to reach their long term solvency ROIs. Judging by the solvency issues bubbling up in a few US pension funds, the negative outcomes have already started to manifest. … Then what to do? Personally I believe that the best place to be in hard assets that has not been bid up by financial inflation. Namely precious metals. This is a time to focus on RETURN OF CAPITAL not RETURN ON CAPITAL (polar opposite of what central banks forces pension funds etc to do). «Gold & Silver COT Report Now Massively Bullish!